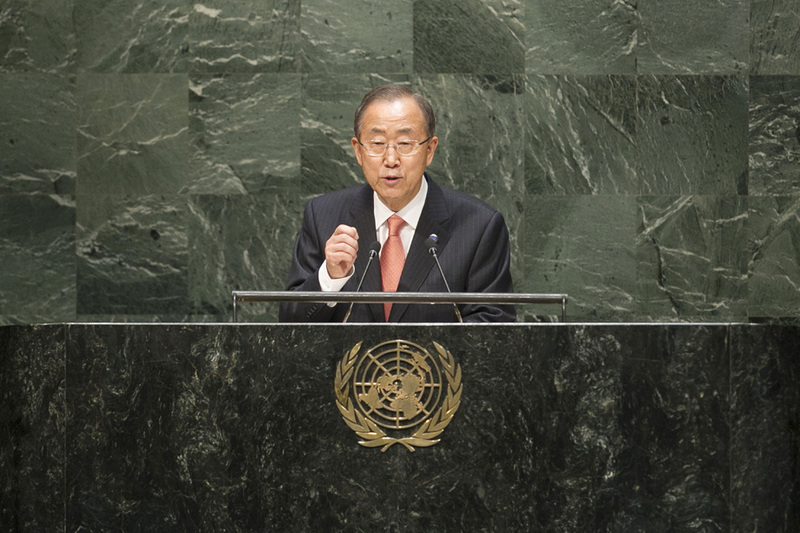 BAN KI-MOON, Secretary-General of the United Nations, said that every year hope filled the General Assembly Hall, the hope embodied in the Charter of the Organization. But this year, the horizon of hope had darkened. Cold War ghosts had returned to haunt the present. "Diplomacy is on the defensive, undermined by those who believe in violence. Diversity is under assault by extremists who insist that their way is the only way. Disarmament is viewed as a distant dream, sabotaged by profiteers of perpetual warfare. But leadership is precisely about finding the seeds of hope and nurturing them into something bigger." It had been a terrible year for the principles enshrined in the Charter, he said, citing many challenges in such places as the Central African Republic, Gaza, Ukraine, South Sudan, Mali and the Sahel, Somalia, Nigeria, Iraq and Syria. The world's "fasten seat belt" light was illuminated. Turbulence was testing the multilateral system, national institutions and people's lives. Human rights provided one touchstone for global response. The Human Rights Up Front initiative aimed to place human rights at the centre of thinking and efforts in the field. The unity of the Security Council was crucial, he said, citing some successes such as the elimination of Syria's chemical weapons programmes; agreement on a peacekeeping operation for the Central African Republic; and timely support for a peace framework in the Great Lakes region of Africa. In contrast, disunity about Syria had resulted in grave human suffering and loss of the body's credibility. Global poverty, child mortality and maternal deaths had been cut in half, though more remained to be done, he said. Those gains showed the power of the Millennium Development Goals and what could be done by working together. An inspiring global conversation was taking place on an agenda for the next 15 years, including the Conference on Small Island Developing States, the World Conference on Indigenous Peoples and the General Assembly special session on population and development. At the end of 2014, he would present a synthesis report that would set the stage as Member States began their negotiations for the post-2015 agenda. Transformation was the international community's goal. But the world's potential could not be unleashed 100 per cent by excluding 50 per cent of its people, namely, women and girls. Climate change was integral to all hopes, he said, describing yesterday's Climate Summit as a landmark event. That momentum must be converted into a meaningful, universal climate agreement in Lima this year and in Paris in 2015. The outbreak of Ebola in West Africa was an unprecedented crisis, and although the United Nations Mission for Ebola Emergency Response (UNMEER) had been established, the global response needed a 20-fold surge in care, tracking, transport and equipment. It had been a century since the outbreak of World War I and 70 years since the founding of the United Nations, he noted. "Yet the world is still not as peaceful as it could or should be." There were more man-made crises than natural disasters — war, poverty and ignorance. Crises caused by people could be stopped by people. "I still have hope. I draw it from the Charter, our enduring guide in times of dramatic challenge and change," he declared.